Spec Miata (SM) is known for its über-competitive field. Because the racing is so incredibly close, the slightest mistake can result in the loss of a position (or five). In these underpowered, momentum-dependent cars, drivers must rely on precise driving technique to carry as much speed as possible through corners. This is particularly true among the top ten drivers, where individual lap times are within hundredths and a slight mistake can cost a driver a place on the podium. 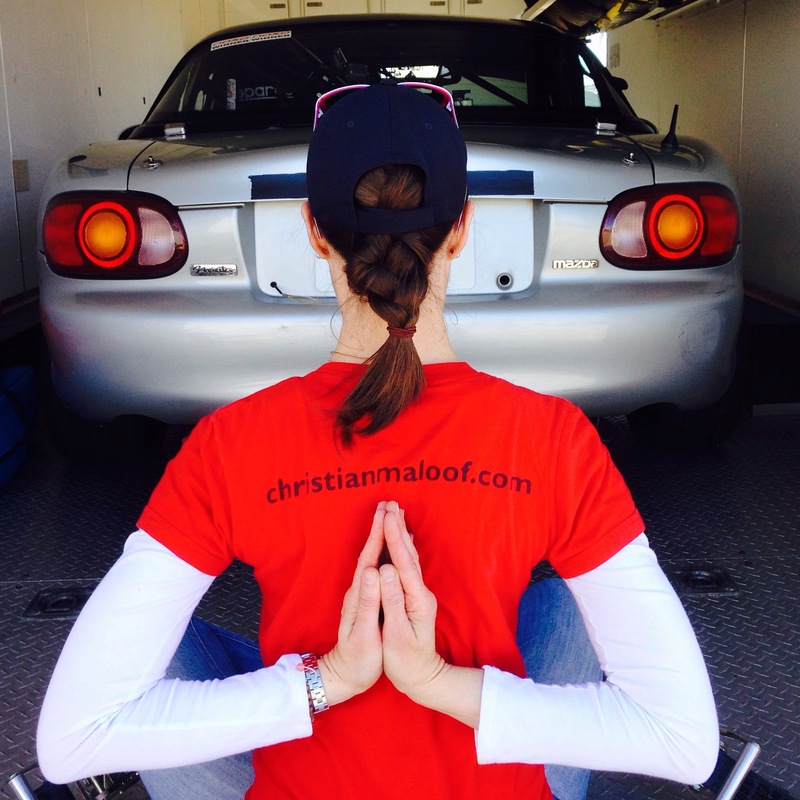 Spec Miata drivers are a close-knit community that thrives in door-to-door racing, but the collegial environment does not mean there is not a fair share of what I affectionately call Spec Miata Man Drama* at the race track. Sometimes – most often immediately after a qualy session or race, when the adrenaline and testosterone are still flowing—drivers approach one another or officials to settle a disagreement. In the era of GoPro, video is generally procured, and it being a race track, there is often a wide audience of informed fellow drivers who are happy to offer their opinions on the validity of a pass, the blame on contact, or whether someone was trying to block someone else. Last weekend was a beautiful one for Spec Miata at Mid Ohio Sports Car Course: the sun was shining, the field was 54 cars deep, and the close-knit community of racers who come together under the banner of SCCA Great Lakes amateur racing were in high spirits for their last event of the year. But in spite of the perfect conditions, there was a bit of Spec Miata Man Drama – and I nearly got pulled into it. At the Saturday race, a fellow SM racer felt that my husband had blocked his attempt to pass and cost him a position. The incident was discussed, and in spite of differences of opinion, my husband offered an apology. That should have been the end of the issue, but it wasn’t. After nearly a decade of being a spectator at Spec Miata races, I’ve witnessed several post-race disagreements both on the race track and off (via the no-holds-barred Facebook, where tempers flare and comments fly). While I can’t always tell who is right (I drive a Spec Miata, but I am not a racer) I enjoy observing drivers interact, discuss, and solve racing issues, because the same principles that apply to disputes in life also apply to racing disagreements: how you discuss an issue matters a whole lot, regardless of the subject. Most often during a post-race dispute, I see racers approach one another, show video, and offer an olive branch in the form of the non-committal “I don’t see it that way but I am sorry,” or even an outright apology for a racing offense. This diffuses the tension, and everyone moves on and goes back to doing what they love. Unfortunately, I’ve also seen racers who approach the (believed) offending party aggressively, waving arms, spouting colorful language, and shoving laptops playing video toward another driver. These confrontations hardly go well because disputes are almost impossible to resolve before getting behind the wheel again, and negative emotions often follow the drivers into the cockpit – which was the case last weekend. Keeping it zen in between races at MidOhio. On Sunday morning, the conditions were perfect for the Spec Miata qualifying race: the track was fast and lap times were coming down quickly for the top 10 drivers. I could tell my husband was driving very well because his lap times were immediately fast and consistently dropping, and the car looked good going through Madness. But in the third lap, he came on the radio and announced he had been hit by a driver, seemingly on purpose, while driving over 100 mph between two concrete walls on the front straight right before the kink. Thankfully he had gathered up the car and continued to race, managing to re-focus and lay down his fastest MidOhio SM lap to date: a 1:41.706. When my husband returned to the paddock, he was understandably annoyed: the crash had cost him 5 positions and affected the car’s balance. His race engineer said, “I had a feeling that person might hit you today.” Turns out the driver who hit my husband had been overheard saying he would like to hit him after watching video of the earlier race where my husband had supposedly blocked his friend. This revelation seemed to upset me far more than my husband. He and his engineer, a seasoned driver and respected Spec Miata mechanic and setup specialist, agreed that the hit was done and nothing would be gained from approaching the presumed offender, and instead they should focus on the upcoming race. I, in the meantime, had to do everything in my power not to march over to the hitter and give him a piece of my mind. Hell hath no fury like a racer’s wife. Most of all, I wanted to ask him what kind of a person is willing to hurt his own car and put his own life in danger to “teach a lesson” to a driver for a perceived blocking of his buddy on the previous day’s race. Forget about the repair bill for the hit, which was the last thing on my mind: the reality is, if you hit someone going over 100mph, you risk injuring or killing them. There is a person inside the cage in that race car – one who has a family that loves and needs him. You risk leaving children without a parent, and for what? To teach someone that they should have let your buddy pass? To gain a position in an amateur race where you get a plastic plaque at the end? I am willing to accept that there are risks in racing, and we prepare for them with safety equipment and driver training. But a person who goes out and deliberately tries to harm another during a race is unacceptable to me. Thankfully, this kind of behavior seems to be the exception in amateur racing. The racers we watch and respect don’t need to resort to dirty tactics or put-downs to win. Last weekend, I enjoyed watching two great drivers –Justin Hille and Frank Todaro—battling hard for first place and displaying intelligent racecraft. Toward the end of the race, Hille conceded to Todaro. I have no idea what the two of them said to eachother after this race, but I have seen plenty of racers after great on-track battles, and they usually congratulate eachother and smile because the biggest satisfaction in racing comes from a hard-fought clean battle for the win. Great drivers in racing are made up of many qualities: talent, racecraft, persistence, consistency, focus, fearlessness and patience. Anger only diverts from these and diminishes your driving. Is there a perfect racer who never blocks or makes a mistake which costs another driver a position or even a race? No. We all make mistakes and hurt people, on the race track and off. We can all stand to improve. Sometimes we don’t even know we are doing something harmful, but if we remain open to learning we can hopefully improve both as drivers and people. Because we are bound to make mistakes, the one thing we can always aim to do is keep our intentions positive. 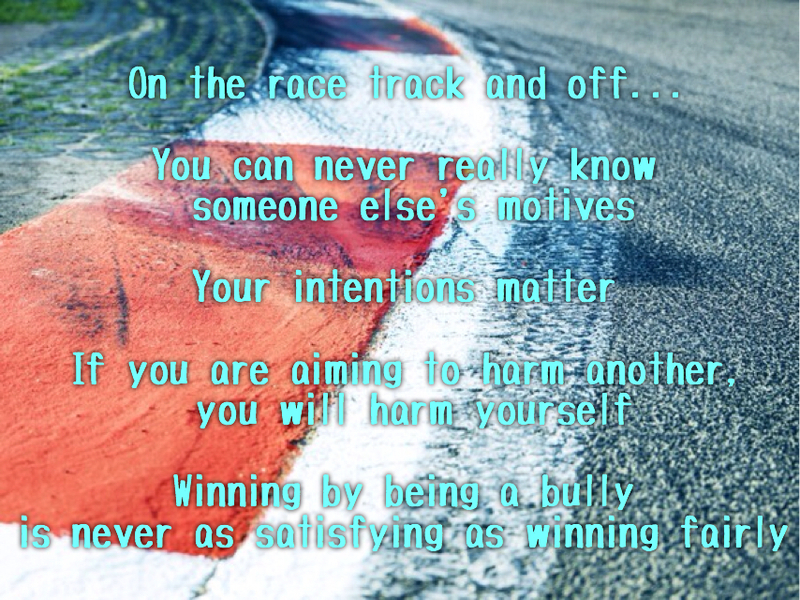 On the race track and in life, our intention can most definitely be to win–but it should never be to do so by deliberately harming others. If you get out on the race track and your aim is to “teach someone a lesson,” the person you are harming most is yourself and your reputation. The repercussions may not happen immediately, but they will happen. The close-knit community will come to know you as a driver to avoid. Most importantly, when you set out to harm someone else, your focus is on the negative vs. on your own growth. When you are focused on someone else, there is no room for you to perform up to the levels required for you to win – guaranteed. My husband was disappointed to start 10th on Sunday’s race, but by the time he lined up, he had left the incident in the past and was calm and ready to do his best. “It’s a beautiful day and there are over 50 of us out there doing what we love,” he said, “it doesn’t get any better than this!” By then, he knew he had won the 2015 Regional Spec Miata Championship, so his goal was simply to work his way up and finish the season strong. I, on the other hand, was worried – the driver who had hit him (and never stopped by to check in) was starting ahead of him, and I was concerned that if my husband caught him, the driver would not hesitate to hit him again rather than let him pass. In the end, I didn’t have to worry – the green flag flew and before the first corner, the race had to be stopped because the same driver who had hit my husband has been involved in contact during a passing attempt the start. As they towed his car away and the race was restarted, I was again reminded that the people bullies should fear most are themselves. The rest of us just have to drive around their wreckage, keeping our cars and our intentions as clean as possible on the racetrack and off. *I did not coin the term Spec Miata Man Drama – I saw it on Facebook a while back. If it’s yours, let me know and I’ll credit you. UPDATE: The creators of the phrase “Spec Miata Man Drama” have been identified! 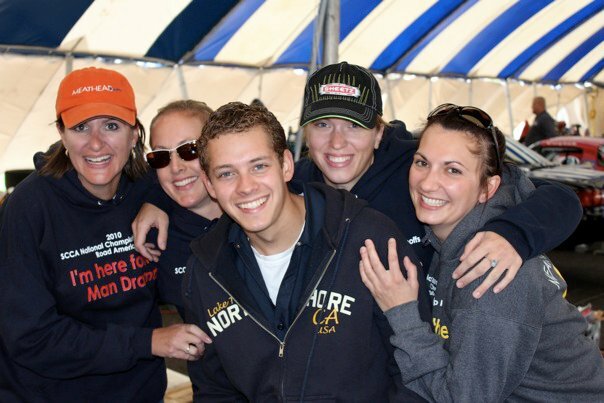 They are The MEATHEAD Racing ladies (Wendy Jackson Collins, Nickie Matters O’Rourke, Christina Jacobs , and Karen Dildei). They wore “I’m here for the Man Drama” shirts at the SCCA 2010 SM Runoffs. Hats off to you, ladies! Thank you! I really appreciate you reading and taking the time to leave a comment.